Home » ★★★☆☆ » Fera. The L is silent. Fera. The L is silent. I am in love with Claridges. I think you get to an age where you just can’t resist. It’s all that Art Deco glamour, the attentive staff and the flattering lighting, not to mention that hit of pure luxe as you walk through the iconic revolving door, flanked by liveried doormen. How to feel special, made flesh. 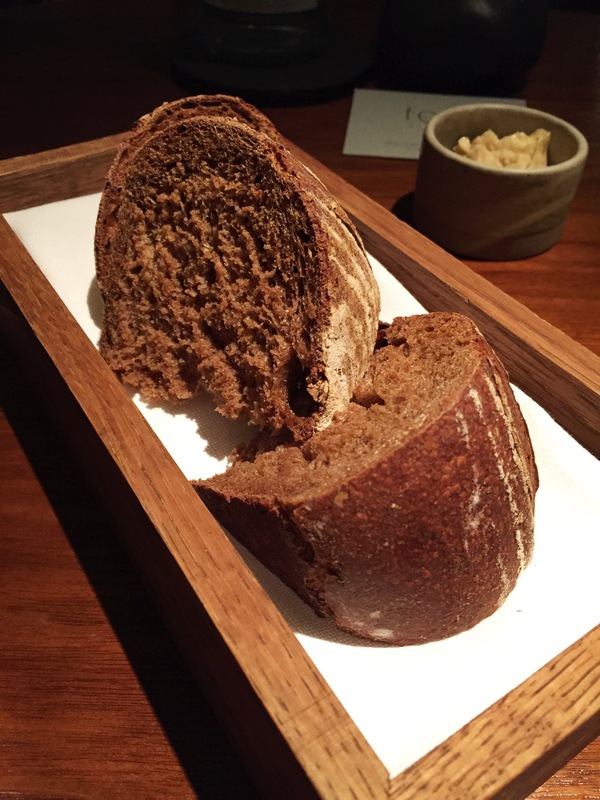 This was my second visit to Fera within a month. I fell a little bit in love with the room on my first visit, but that was because I could actually see it. This time, at the back of the central island with a great view of the kitchen and the waiters’ entrance, not so much. Tip: choose one of the outer tables in the raised area. It’s a room of subtle colours and a good mix of the folksy and the formal, unrecognisable from the days of Ramsay with his oversized lampshades and underwhelming food. A large, denuded tree sits centre stage and warm, earthy tones fill the room. There is the requisite Claridges glitz but it’s ever so understated and there are a few quirky touches. Silver fronds on the columns, I’m looking at you. And from that first visit, with C (enthusiasm hovering around the mid-mark) only a few memories remain. Great rye bread, with caramelised butter and a little amuse-bouche of rabbit, which I refused because I can’t bring myself to eat fluffy bunny. 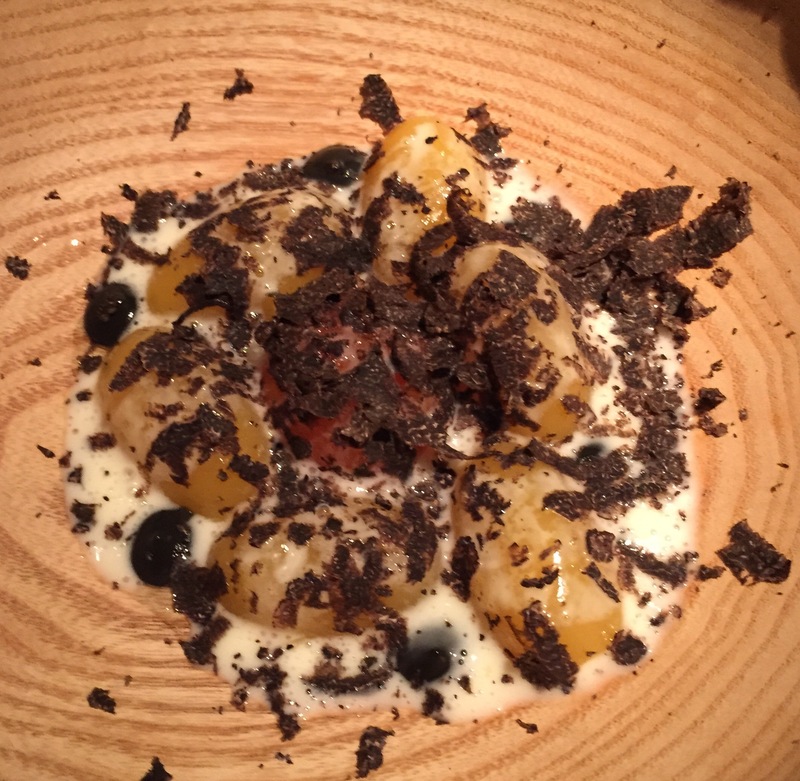 The most memorable part of that meal was the dessert of caramelised apple and celeriac ice cream, the apple reduced to a chewy, date-like texture and a brilliant match for the celeriac. A revelation, that combination. But I wasn’t sure what I’d thought about the whole deal and umm’d and aah’d until the review drifted too far away to write. Out with esteemed colleague J and A, my most food-forward client, I wasn’t sure we would manage to actually get there. I’m on a diet, says J, I can’t eat anything. I need to leave at 8:30 emails A, and can we go to the new Alan Yau instead? I look at the website of said Yau in Soho and it is Turkish pide, a sort of pizza/flatbread. This will not work in my January world of no bread, so having said yes to pide in a people-pleasy sort of way, I have to backtrack and say no to the change. You have the Opentable offer, says the waiter. Do we? I say, having no memory of any such thing and panicking about the horror of fewer choices. The “offer” is a glass of champagne and the possibility of the set lunch menu (at dinner) at a very reasonable £35 a head. Obviously we ignore the good value menu and go for the à la carte, because we clearly do not have time for the tasting menu and neither will it work, what with the I-have-to-be-away-by-8:30 and our respective January health/weight-loss regimes/food faddy nonsense and there is no way a tasting menu is going to accommodate the multitudinous requirements and I don’t even suggest it. 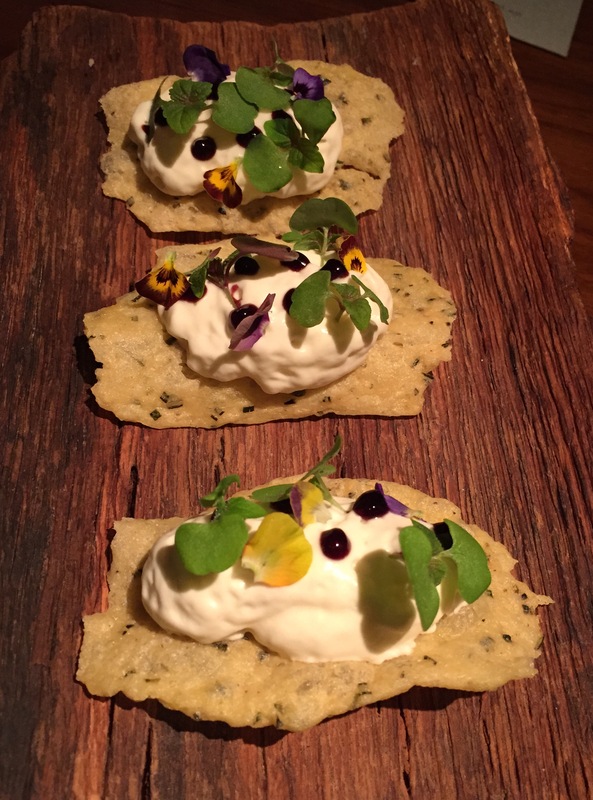 We are brought a log plate with three chickpea crispbreads and a blue cheese foam, with micro-leaves and petals scattered over. It is delicious, but J leaves hers and in a first for mankind, I do not immediately hoover it up. Then amuse-bouche but I remember the rabbit just in time and instead both A and I have what tastes like a posh onion bhaji but is stewed millet, fried, on a lovage cream. It is wonderful, light and crisp. I want more. J has the bunny version but it is strangely small, possibly a third of the size of the ones I saw on the earlier visit. I don’t mention that. J and I choose the same starter of scallops, celeriac and caramelised parsnip. It is the dish I ordered on my last visit but it looks quite different. 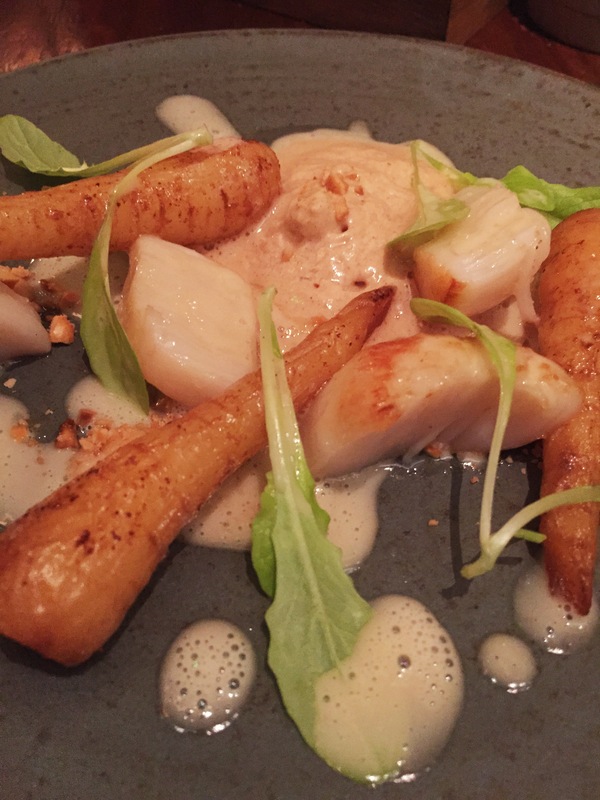 The scallops appear smaller and the parsnips are not so much baby as foetal, but it tastes good and is very prettily arranged and I like the sweetness of the dish and the hazelnut crunchiness in the creamy sauce. Meanwhile on other side of the table A declares the swede dumplings with black truffle to be the best thing he has eaten in some considerable time, if not ever. He suggests I taste. I do. It is good, the tang of the swede adding a welcome high note. The dumplings taste like gnocchi. As an American, he has not had the joy of swede and is a convert. I do not want to deflate his balloon and tell him that it does not always taste like this. He has never experienced the soggy sorrow of Christmas swede and carrot and hopefully he never will. There is a slightly strange extra course of warm cheese with crispy bacon bits on top. It is served at room temperature and there seems to be chopped duck at the bottom which I feel is a little de trop and I don’t much like. But it’s generous of the kitchen and I eat mine and refuse the bits of J’s, which she has left. Both J and I choose the sea bass and oysters and horseradish cream. The fish is fine, albeit a fairly compact serving. 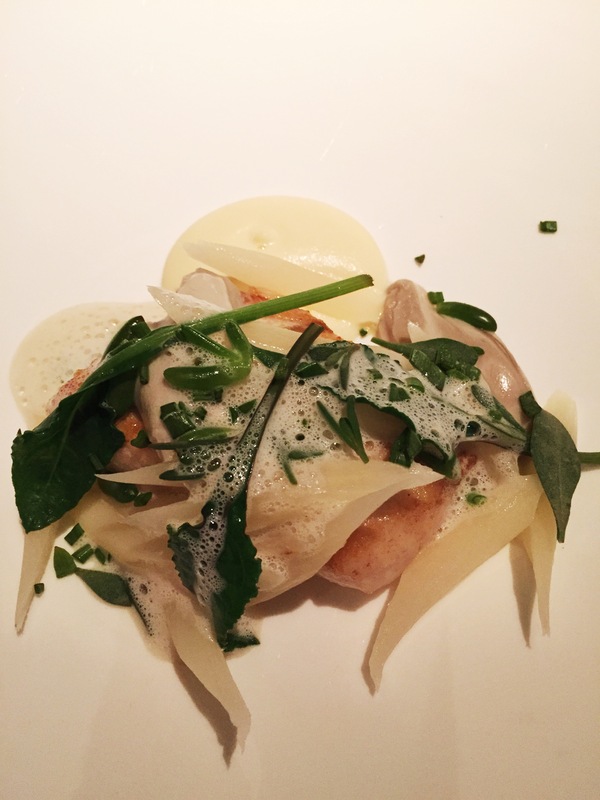 The oysters are draped over the fish like pallid slugs and the whole dish is without any excitement, the horseradish cream failing to add much bite. A, meanwhile, is having his own party on the other side of the table with his vegetarian main course which looks like nothing more than raw mushrooms, and a few bits of salsify topped by something that resembles black cherry yogurt circa 1970 but it also contains roasted red cabbage and shallots. He insists I taste, as he did with the swede of joy. It is much better than it looks, but I am still not sure what the purple gloop is. He likes it, but not as much as the magic gnocchi/swedes. I feel put out by this stage as he is encouraging me to dig into his plate but rejects all offers of fork-to-plate action in my direction. This happens throughout the meal in a slightly pass-agg sort of way. It’s an unspoken thing, the I taste yours /you taste mine pact. One side refuses and the balance of power shifts. We have a pre-dessert in a frozen bowl. I think it is cryogenically frozen chocolate but I am not sure. Naturally both J and I shun proper dessert, but A is up for it notwithstanding that 8:30 has come and gone. I upsell the apple, and he asks the waiter whether he should have the apple or the gingerbread. Have the chocolate cream, says the waiter, perhaps not hearing the question. A cushion of set chocolate cream, rich but without that chocolate rush so beloved of addicts, surrounded by crumbs, two yellow blobs which taste of nothing recognisable, ice cream and a chocolate wafer, I was not overcome with plate envy. Half was left uneaten by the man who had to get away. The Summing Up: Fera. It means wild. Not a word I’d immediately associate with this grande-dame of hotels and this formal presentation of forage-style food, albeit on rustic pottery, doesn’t quite have the same feel as it does in say Clapham, at the Dairy, or Lyle’s in Shoreditch or even in Cumbria, at the mothership, where this style of cooking feels more appropriate. 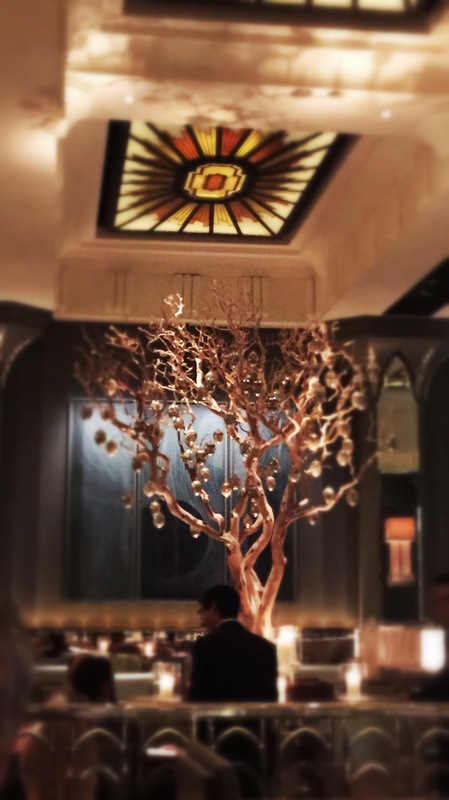 It’s an interesting choice for Claridges, Fera, with its emphasis on the wild and seasonal in the centre of London. Experimental food in a conservative environment is always going to be a challenge and whist it offers good value for money when you include all the extras, silly pricing, like £5.50 for lemon and a few slices of ginger leaves a bit of a sour taste. No wheat = I eat. I used to love Ski. Pining for the sea buckthorn. I think you may well be right. I’m not sure this food works in this hotel to be honest. But what do I know. 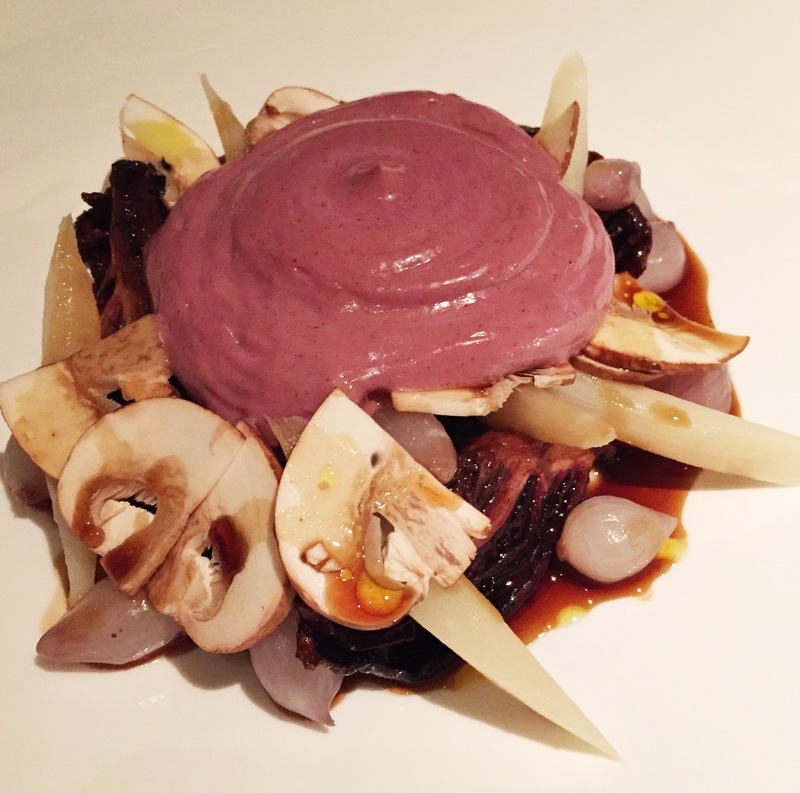 I found myself in agreement after visiting Fera – the cooking is very accomplished and the staff as professionally friendly as any other restaurant in that part of London, but the overwhelming effect is one of presentation over substance. 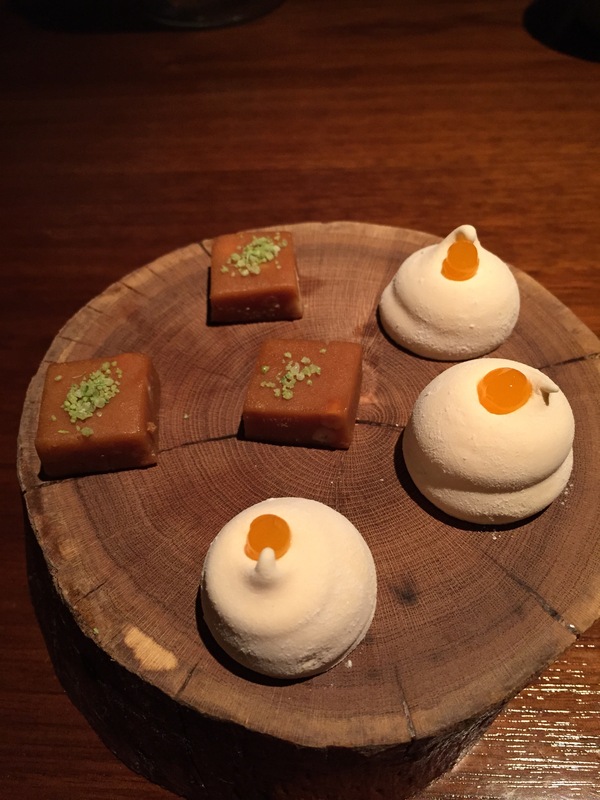 And the presentation (no white linen, lots of beige and green glazed earthenware and lots of edible flowers) somehow jars with Claridges – the most marked contrast is the nightclub style entrance to Fera (which has the feeling of something management have imposed on Rogan). All credit to the management for trying to be forward thinking, but it will be interesting to see how long this lasts. 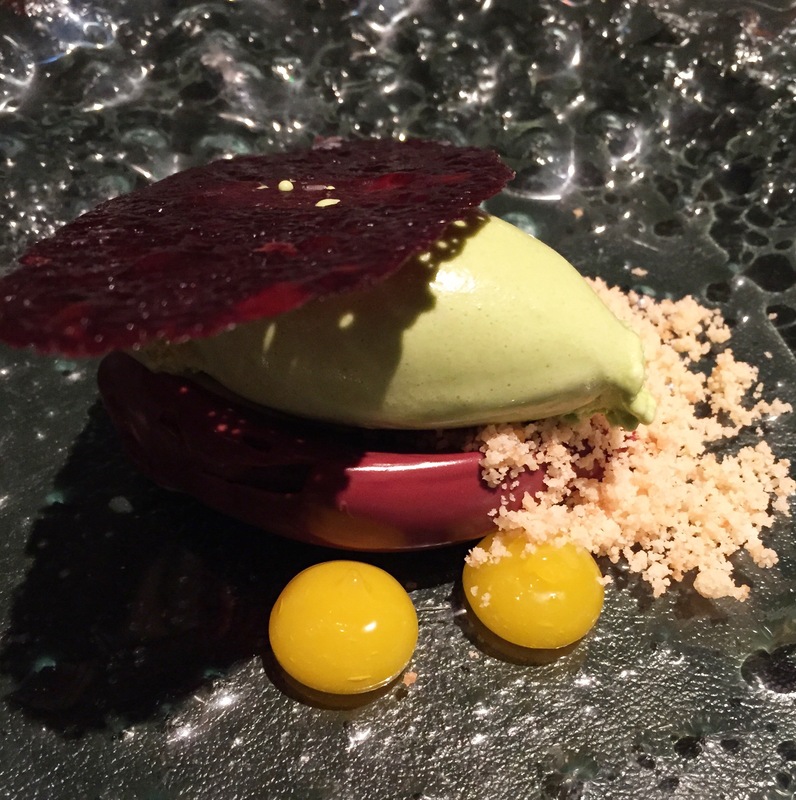 May I thank you for drawing my attention to that review of L’Enclume. I wasn’t aware that Victor Lewis – Smith had done restaurant reviews and I think he should do them more often. 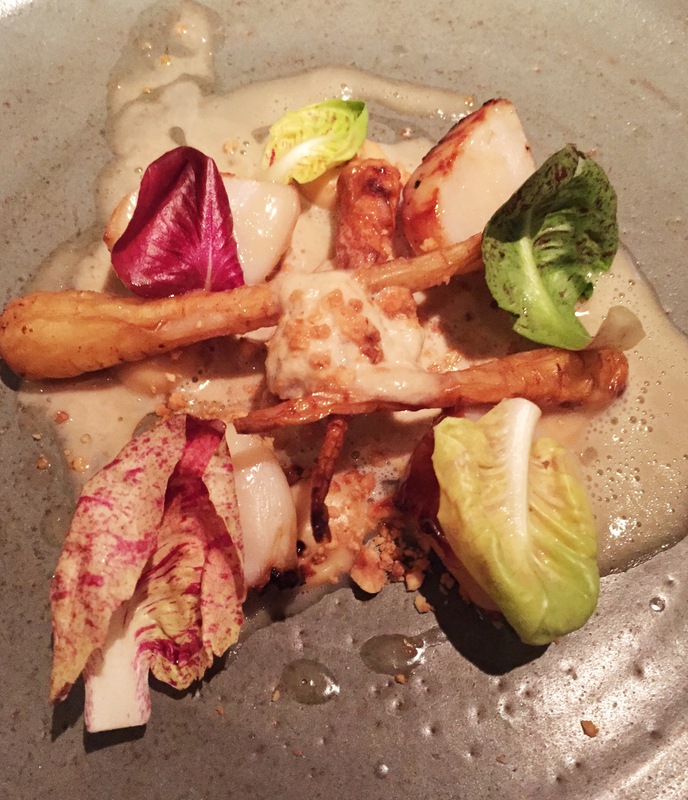 I also felt that L’Enclume was entirely formulaic and lacking in spontaneity and it is not the sort of experience that I particularly seek. It can be done properly – Kitchen table at Bubbledogs seems to manage it because he does change the menu often and it is based on seasonal. It is also more simple. I agree – the homespun doesn’t go with the glamour and the whole thing just felt slightly awkward. It wasn’t a place I felt comfortable.